The official WDAS site is never updated ( ) but I just discovered that the YouTube channel has had this video explaining how snow simulation works for some time now. This is technically off-topic, but I thought I'd post it here since this thread is currently the most frequented one for Disney Animation. The Lego special was pretty funny, very much in line with the typical Lego humor. Production artwork by Lisa Keene. It's such a beautiful, detailed, digital painting. That's stunning. Better than any shot in the movie. 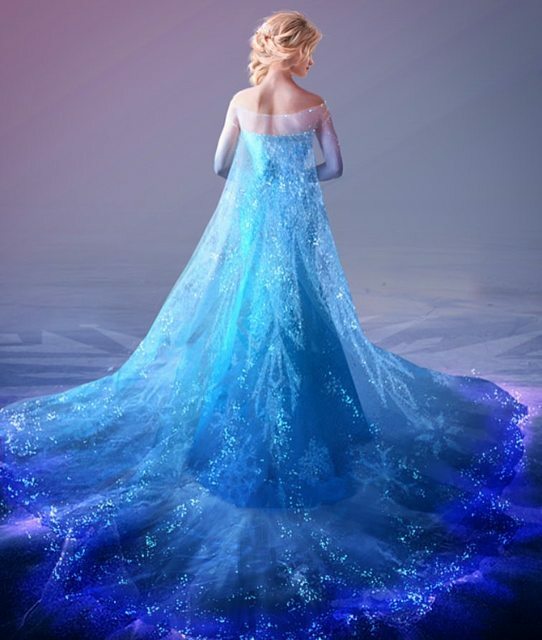 A Chilean singer is suing Disney because he claims Let it Go is a rip-off of one of his songs. The chorus has some similarities with the Frozen song, but I think it's just a coincidence. I don't believe this had been revealed before. 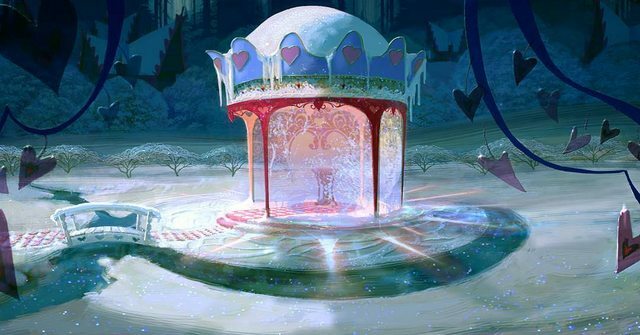 When Giaimo started work on “The Snow Queen,” his intentions were to approach the project with curves as the main design element. It was originally planned as a hand-drawn feature full of whimsy, but then the story changed drastically. The original treatment featured the queen as a campy villain, with Bette Midler in mind for the role, and the story took place in a tiny village called “Mistletoe” which didn’t even have a castle. Anna and Kristoff were citizens, but had no relation to the queen, and a matchmaker had paired the two together before their adventure began. Very early on when developing Frozen, Snow Queen back then, we had a fun little village called Mistletoe. This was a gazebo in the center of town. As much as I like Frozen (the finished product), I still remember being pissed when this was no longer a hand-drawn Menken musical. The idea of a Bette Midler villain sounds fantastic on paper, although I don't see her as an ice queen type. I imagine the idea of the villain-who-isn't-really-the-villain came about around the time they brought the Lopezes on and they decided they wanted something "Defying Gravity"/Idina moment in the film, which required a misunderstood villain. The character he says he was going to voice still has a similar line in the movie. Maybe they changed the line after he had recorded it and someone else read the new one because they thought it wasn't worth calling him back to record just one line. Though that doesn't match with what he tells about the scene. Either way, it is true that he initially had a part in the film, because he even did a promo for the film. In case anyone still had doubts, it has been revealed it was Lasseter's doing that the marketing campaign focused on Olaf and underplayed the sister aspect. Before the release of “Frozen” in 2013, some consumer-products executives thought moviegoers—and specifically boys—would respond to Olaf, the goofy snowman sidekick of the film, people familiar with the matter said. Mr. Lasseter didn’t want the movie’s marketing to focus too much on the sisters and risk being written off as just another princess movie, his former colleagues said. For some Disney employees, Elsa and Anna embodied just the kind of message they wanted to send—only to see higher-ups play it down for fear of alienating boys. “The creative side has leeway and scope. And then there is this massive, unwieldy side dictated by middle management that can really dumb up the machinery, which is why you can have a progressive film like ‘Frozen’ but then see that the company focuses consumer products on Olaf,” said one former Disney executive who worked on the princess brand. Thank you blackcauldron85 for the video. Never heard of him before, but he's hilarious! In case anyone still had doubts, it has been revealed it was Lasseter's doing the marketing campaign focused on Olaf and underplayed the sister aspect. I hope to gosh Jennifer Lee dramatically changes their marketing game. Lasseter has caused so much damage to WDAS's marketing. His title changes are unforgivable. I mean, this trend started with Tangled and how the trailers seemed to highlight Flynn Rider more than Rapunzel. Which was obviously a direct response to The Princess and the Frog not doing the numbers they hoped for. I have mixed feelings about Frozen's marketing. On the one hand, it was misleading and wildly misinterpreted the film (the teaser and first trailer, anyway. The third trailer was fantastic). On the other hand, the film made over a billion dollars, so the marketing must have done something right. Although it was also helped by being THE family event of the holidays. On the other hand, the film made over a billion dollars, so the marketing must have done something right. Although it was also helped by being THE family event of the holidays. Well, 2013 was a mediocre year in the animation realm. Turbo, Free Birds, Legends of Oz and others were sour spots that year. I'm sure Frozen likely played on the sweet spot of Christmas/holiday film goers plus was one of the only films that took it's audience semi seriously.